Zabuton cushions abound as Hakuho loses: the Yokozuna falls, literally, in a sold-out Ryogoku Kokugikan… and we have the video to prove it! 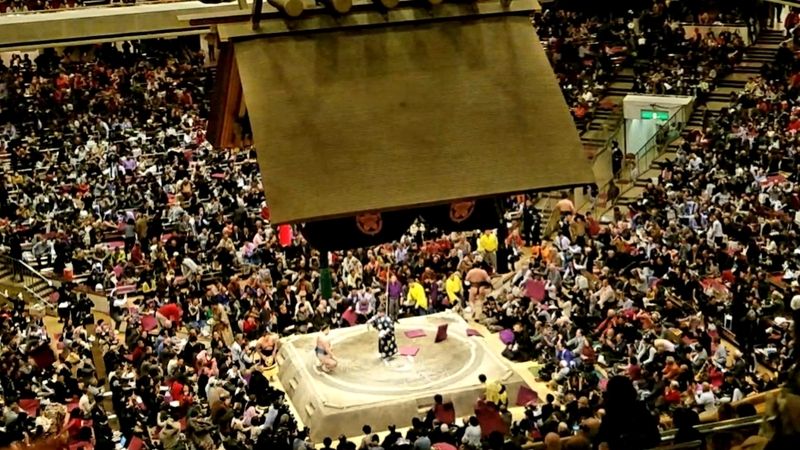 At the start of yesterday we had some spare tickets to Sumo on 24 and 25 January. A few tweets later and they were in the hands of some amazing Maction Planet guests, who joined our resident Sumo expert and superfan Mac, Founder and Lead Guide of Maction Planet, today in witnessing one of the upsets of the tournament so far. Hakuko is the greatest Sumo wrestler of all time. On 21 July 2017 he beat Takayasu in Nagoya and crossed 1047 career wins, making him the the greatest of all time. We at Maction Planet love to celebrate success and Hakuho’s commitment and dedication to the sport has brought back fans after years of scandals and declining interest. He truly is the G.O.A.T. Going into 23 January 2019, Hakuho had a 10-0 record in the current tournament, until komusubi Mitakeumi handed the 41-time champion his first loss, returning from injury to pull off the biggest surprise of the New Year Grand Sumo Tournament so far. Day 12 (today) saw another upset as sekiwake Tamawashi, going into today’s fight 9-2, had everything to play for as a win against his fellow Mongolian would mean he would tie for the lead. Tamawashi went into today’s fight having won five straight bouts, beating former ozeki Kotoshogiku yesterday. Mac had a feeling all was not going to go the champion’s way, and decided to take a video, hoping to capture a rare moment when the Yokozuna is defeated by a lower ranking wrestler and excited spectators throw their Zabuton cushions into the ring… and that is exactly what happened as, after a lot of tradition and posturing Hakuho and Tamawashi went head-to-head and the underdog emerged victorious! Hakuho loses two in a row and the final three days of this tournament are going to be some of the most exciting in recent Sumo history… and our lucky guests will get to enjoy it all! Thank you to all our guests for joining this incredible day.